A heist of one’s own: Steve McQueen brings Widows into the now. 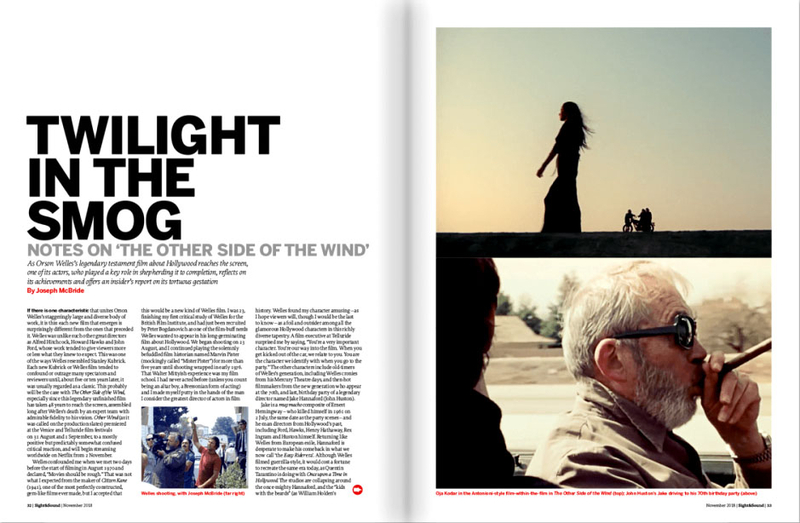 Plus Panos Cosmatos on Nicolas Cage and Mandy, Joseph McBride on Orson Welles and The Other Side of the Wind, Sandi Tan on Shirkers and lost dreams, and our Deep Focus season on the French fantastique in cinema. 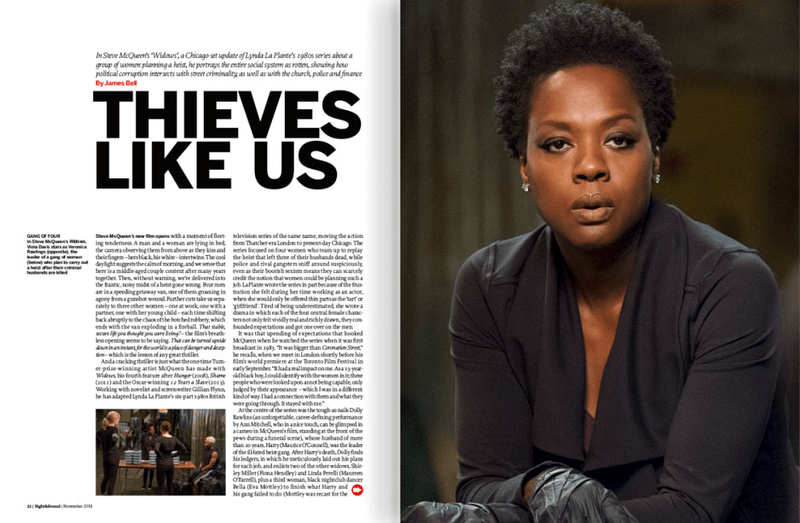 Our November issue comes equipped for a robbery, as we sit down with Steve McQueen to discuss his latest film Widows, a thriller that updates Lynda La Plante’s hit 1980s TV series about a group of women planning a heist in Thatcher-era London. McQueen’s thrilling film moves the action to present-day Chicago, with a brilliant Viola Davis leading an ensemble cast that includes Daniel Kaluuya, Colin Farrell, Liam Neeson, Michelle Rodriguez, Elizabeth Debicki, Brian Tyree Henry and Robert Duvall. 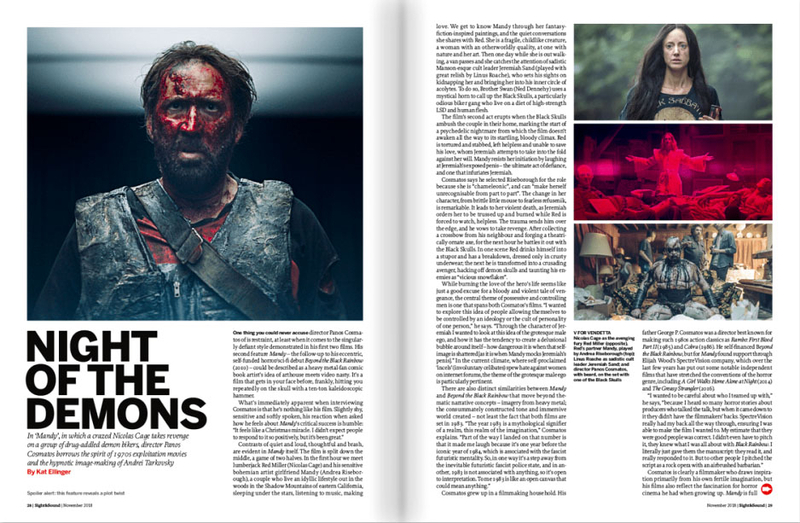 An actor who’s more iconoclastic than iconic is Nicolas Cage, who’s spent much of his time in recent years starring in absurd big-budget fantasies, but who has found a film to match his singular onscreen presence in the instant cult hit Mandy, in which he plays a lumberjack who takes revenge on an occult group of drug-addled bikers. Kat Ellinger talks to Mandy’s director Panos Cosmatos about his film, which she describes as “a heavy metal-fan comic book artist’s idea of arthouse meets video nasty”, and about the joys of working with Cage. Of course, the quintessential Hollywood outsider was Orson Welles, and this month sees the very belated release of one of his late films, The Other Side of the Wind, which was shot in the early 1970s but never finished in Welles’s lifetime. However now thanks to the efforts of a small band of believers, a version of the film has been completed, following notes left by Welles. One of those believers, Joseph McBride, appears in the film itself, and was a consultant through its tortuous gestation and path to the screen. Writing in our new issue, McBride gives an insider’s account of his experiences, and an insightful analysis of this late work by one of cinema’s greatest artists. 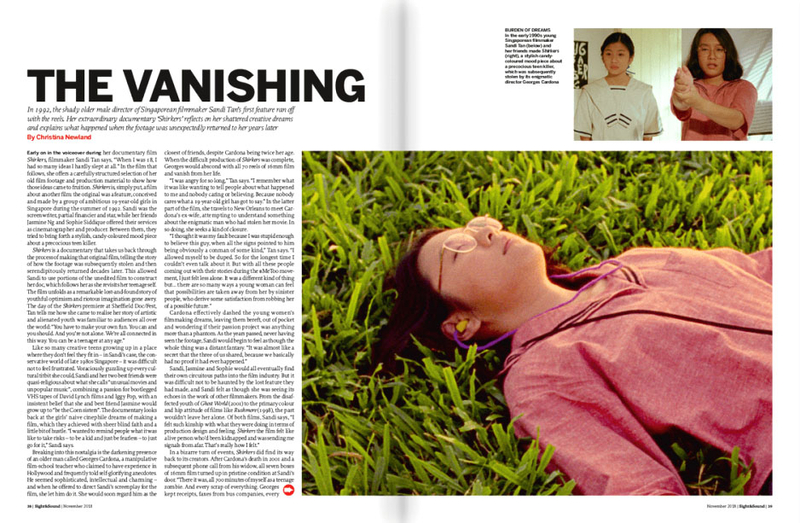 A belated completion also marks Singaporean director Sandi Tan’s brilliant documentary Shirkers, which recounts the extraordinary story of how the debut feature she made with friends as a teenager in 1992 was snatched from her when its co-director ran off with the reels, only for those reels to turn up again 20 years later. Christina Newland talks to Tan about the pain of shattered creative dreams and what-ifs, and how making her documentary brought a sense of closure after so many years. 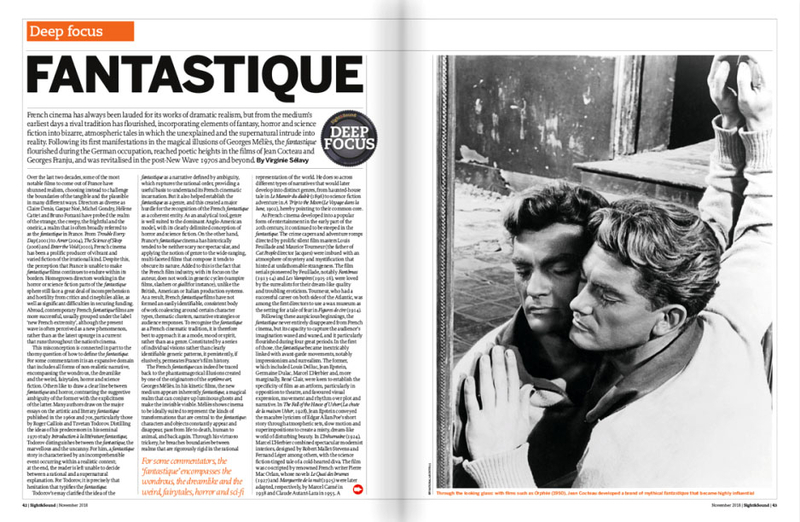 Finally in this month’s features pages, our regular Deep Focus series looks at the weird and wonderful word of the French fantastique in cinema. Published to tie in with a companion season programmed by Sight & Sound and running at London’s BFI Southbank from late October through November, Virginie Sélavy’s article explores the long and rich tradition of the cinematic fantastique, which incorporates elements of fantasy, horror and science fiction into a bizarre, atmospheric tales in which the unexplained and the supernatural intrude into reality. Taking in directors from Georges Méliès and Jean Cocteau to Georges Franju and Jean Rollin, Sélavy’s article is the essential accompaniment to the BFI Southbank season. Autumn means it’s the time when the big festivals start unveiling the titles likely to compete for the major awards in the awards season early next year, and our November issue includes reports from two of the most important events: Venice and Toronto. Across both festivals were the films likely to dominate screens over the coming months, from Yorgos Lanthimos’s The Favourite to Jacques Audiard’s The Sisters Brothers, from Alfonso Cuarón’s moving Roma to Claire Denis’s typically idiosyncratic science-fiction film High Life, and from the Coen Brothers’s western The Ballad of Buster Scruggs to Barry Jenkins’s sumptuous If Beale Street Can Talk… our festival reports cover them all and more. Elsewhere in the issue our reviews section covers all the month’s releases, including extended reviews of Bradley Cooper’s A Star is Born and Damien Chazelle’s First Man. Our Books pages include a definitive account of the making of Kubrick’s 2001: A Space Odyssey and a life of Bruce Lee. 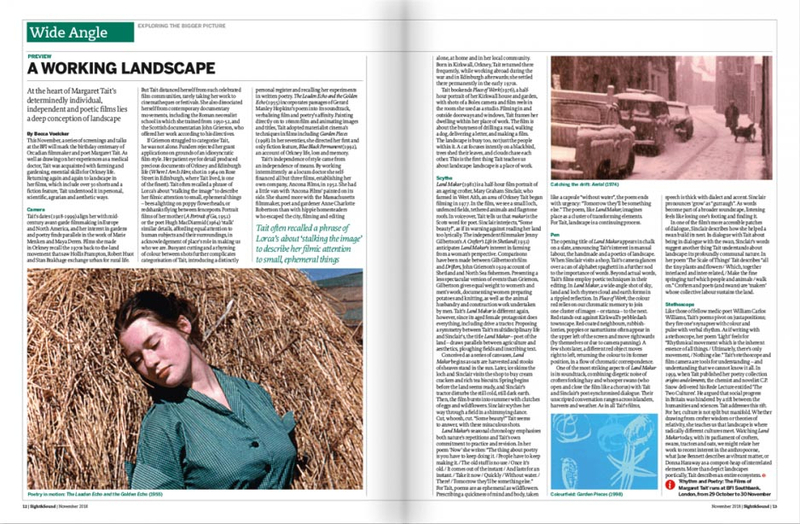 And our Home Cinema pages include a look at the early films of Olivier Assayas alongside a bounty of other curiosities. All that, plus a fond remembrance of the late, great Burt Reynolds, an interview with Black Mother director Khalik Allah, a survey of the work of Margaret Tait, and much more besides.